This isn’t a political rally or a religious debate, and we’re not here to choose sides – we’re here for the dogs. However, occasionally political and religious figures do crop up in the dog news world. 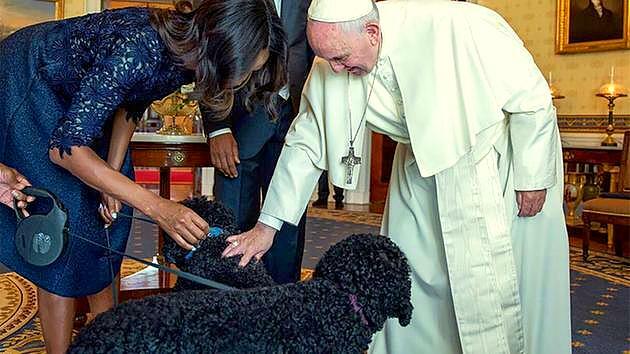 History was made on Wednesday when Pope Francis visited first dogs Sunny and Bo when he visited the White House. 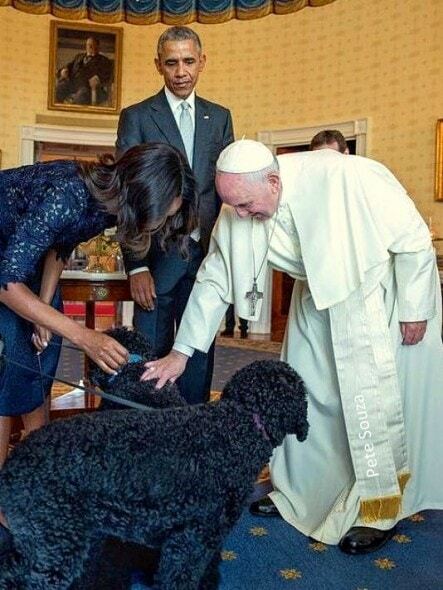 While visiting with the Obamas, the Pope made sure he greeted their Portuguese water dogs – an uncharacteristic papal move. However, we already know that this man is far more modern than his predecessors, particularly when it comes to dogs. White House photographer Pete Souza managed to capture the special snap. I’m not a fan of the pope but I’m truly a fan a dog’s. That was nice. I am a fan of the pope and all animals 🙂 Such a nice , warm , humble person no matter your color or religion .A true human ! I’m all for dogs sharing their love and happiness, and for others doing the same for towards the dogs! He loves all creatures 🙂 I am not Catholic either. Came for the dogs, stayed for that stunning dress Michelle is wearing. God bless the poor lil’ dogs that have to live with Obama ! Thank you Pope Francis for being so kind and humble! All animals deserve compassion and respect. Makes me want to be Catholic again…. Probably far more interesting that Mooch or Barak. St. Francis is the patron saint of animals. Helen Tillem Bo and Sunny! I’m not Catholic but I had such a good feeling about this man from the time I first heard about it. His humility is what I admire most. If I ever went to the Vatican & he was making an appearance, I would wait endlessly for him to bless me. Does the Pope have any pets…do they allow them in the Vatican ? Yes, but of coursem he is named after that wonderful Saint. Now I like this Pope even more! I would be honored to be compared with a dog. They are so much more honorable and ethical than we humans. Thank you Pope Francis. Do hope that with your blessing, a miracle will happen and the wrong that is currently being done to the dogs and cats in Malaysia, China, Korea, Romania, Vietnam, Indonesia and more can be stopped. Those dogs live way better than many of us I thought the pope was here for the ones that are in need!!! He said dogs go to heaven, and I’m holding him to it. Who has a leash on their dog in the house? I don’t care if I’m POTUS, my dog isn’t going to be on a leash in their own home! My dog has her own chair and look how happy she is! On leash is the best and safest way to introduce dogs to new people. That’s great. He is a wonderful Pope. Sadly they use retractable leashes on the dogs. These dogs are now blessed and will be on a mission to tell a tale to their other 4 paws friends. Obama is not impressed that he is not the center of attention. I’m not Catholic so I don’t know about such things but, from the way Pope Francis is touching the dog…I’d say he is blessing him. I read a article where the Pope said all dogs have souls and they do go to heaven. The pope is a-ok by me… I love that he took the time to address what the catholic religion says and doesn’t say about animals… His sensitivity and warmth toward animals and animal lovers is admirable… Which should earn him immense respect regardless of religious belief. Love this man even more now. I love this Pope , a very humble man !!! Seriously? ?/ This is NEWS WORTHY…. like he’s never pet a dog before??? I’d rather hear about the private conversation he had with Obama! I don’t know. Those two dogs don’t look like they like him, let alone their owners. And why torture the poor pups just for a photo op? Let them go play with the ones that REALLY take care of them. That was probably the best part of his visit. Dogs rule! I really do respect our Pope. He is a true kind human being to all creatures. God bless him! History was made because he stroked a couple of dogs??? I love this beautiful person. He loves animals. A pure sole inside and out! Beautiful! Glad the Pope bless the dogs, they deserve all the blessing of the world. I really love this Pope! I’m still 1% Catholic because of his progressive ways. The two purest hearts in the White House. Of course he would want to visit with them ?? some of the comments here are just horrible. look beyond the political and religious stuff and just care about the dogs. that’s what this page is about. He is a false prophet. Well his namesake was St Francis- lover of all creatures! Pope Francis is a winner to me, and I am not Catholic, either. He is like a breath of fresh air. Well bred dogs purchased from a responsible breeder.